Fancy a sunset sail on the Mediterranean sea, then out for an amazing lobster dinner served with traditional Spanish champagne? Step aboard the Orsom Catamaran and enjoy a two-hour cruise along the coast of Barcelona. A live jazz musician plays as you soak up the sun and sip your sangria. The sailing tour is very relaxing, perfect for anyone who has spent the day sight-seeing. 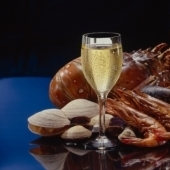 Afterwards, a lobster dinner will be served in one of Barcelona´s best port bars, served with a bottle of Cava, a traditional Spanish champagne.